This book has a very special place in my book-shelf, cuz its been Personalized by The Man himself. Yes, Khaled was here in Toronto last week in one of the most beautiful Chapters store I've ever seen. He was here for the promotion of his new release. Today its been exactly 8 days that I shared a stage with him. My awwww moment. Once in life time moment. Khaled is a gifted storyteller. I can say this because his this novel starts with a story. Just with the first few pages i knew i was in the hands of a master storyteller. I knew he is going to take me to a roller coaster ride and he makes sure that i reach my destination safe and sound. I hate it when a good book ends. I feel like just keep reading , reading and reading !! This novel is one such. One more thing i want to add here is the way he portraits WOMEN in his books. OMG, I think, by far, he is the only male author who portraits women so beautifully like no one does. The same question was asked to him in the event I attended and he said, "May be i understand women very well." to which she said, "You are the only male who understands women so well. These days husbands don't understand their wives." And everyone had a little laugh at that point. And The Mountain Echoed will have you hooked from the first paragraph till the last paragraph of the book. 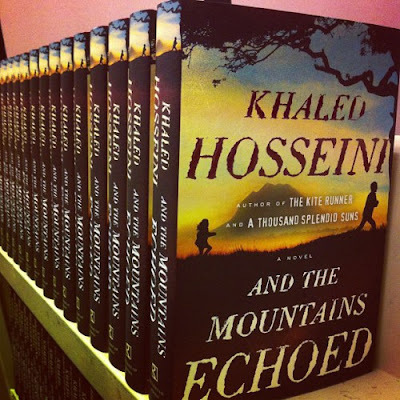 Another unbelievable piece of work by Khaled Hosseini which you don't want to miss. GREAT review...thanks. I haven't read his book yet. Thanks for stopping by n you should read his book. I can't wait to read this, I loved Kite Runner! This is a great review I think I will look for this book on our vacation we will be on soon. How much fun is it to read a book while sitting in a beach chair with the Atlantic Ocean running over your feet. I loved this book. Hosseini again brings to life the people of Afghanistan and it is as if I know them. He draws them so well and clearly. He mixed the chapters artfully so that they would always come back to something that would bring a memory from earlier in the story. Ths story of the div taking the beloved son really affected me. I enjoyed this book.